Recently, UK collectors Richard Hutchinson and Ben Coomber unearthed some interesting bits of Palitoy history. They found these in a "time capsule" lot of early Star Wars material auctioned by Vectis. Basically, they bought a ratty old suitcase filled with unspecified Star Wars stuff. You can get an idea of what was in this suitcase by taking a look at their YouTube video concerning the find. You can also catch up with this Rebelscum thread discussing their purchase. There was a bunch of cool stuff in the lot, including a vinyl cape Jawa. But my favorite item is a scrapbook comprised of vintage magazine and newspaper clippings, many of them focused on Palitoy's offerings from the late 1970s. 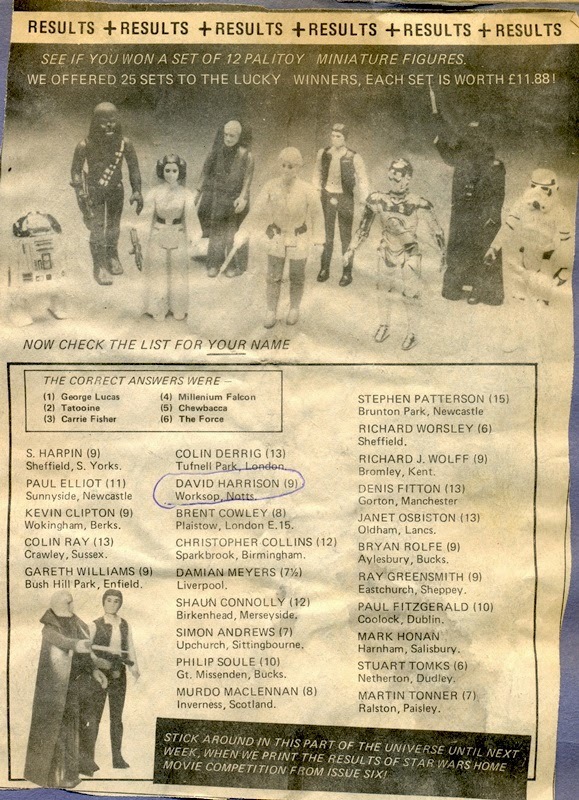 Fascinatingly, these include some material related to a "Star Wars Weekly" contest among whose winners were the original owner of the suitcase, David Harrison. 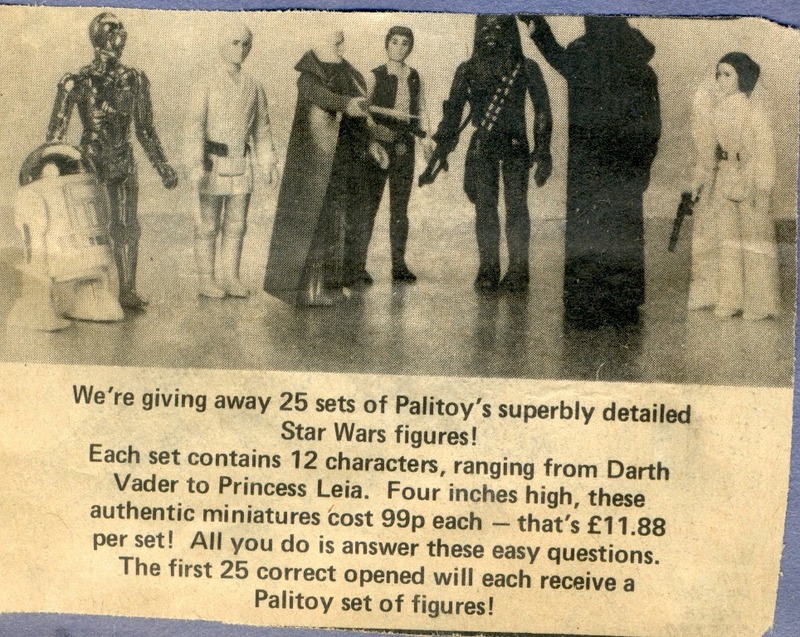 The prize: a set of the first 12 Star Wars action figures. Nine years old at the time, David was so thrilled to win the prize that he saved everything related to it. Below you see his clipping of the original contest advertisement. And here you see his clipping of the announcement of the prize winners. In an understandable gesture of triumph, David circled his name. 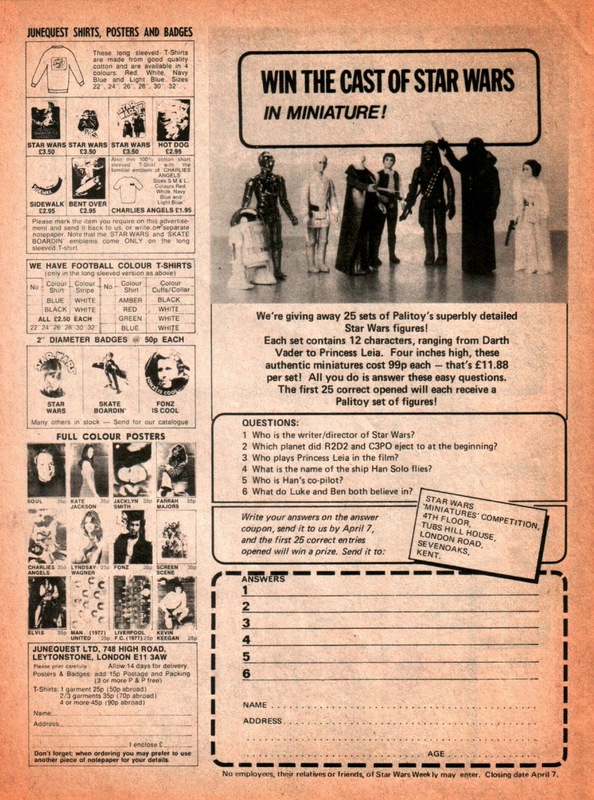 You may have noticed that the original ad depicts only eight of the 12 original figures; Stormtrooper, Sand People, Jawa, and Death Squad Commander are not pictured. This is surely because Palitoy didn't yet have those figures on hand. By the time the contest's winners were announced, the Stormtrooper must have arrived, because there he is in the photo accompanying the announcement. 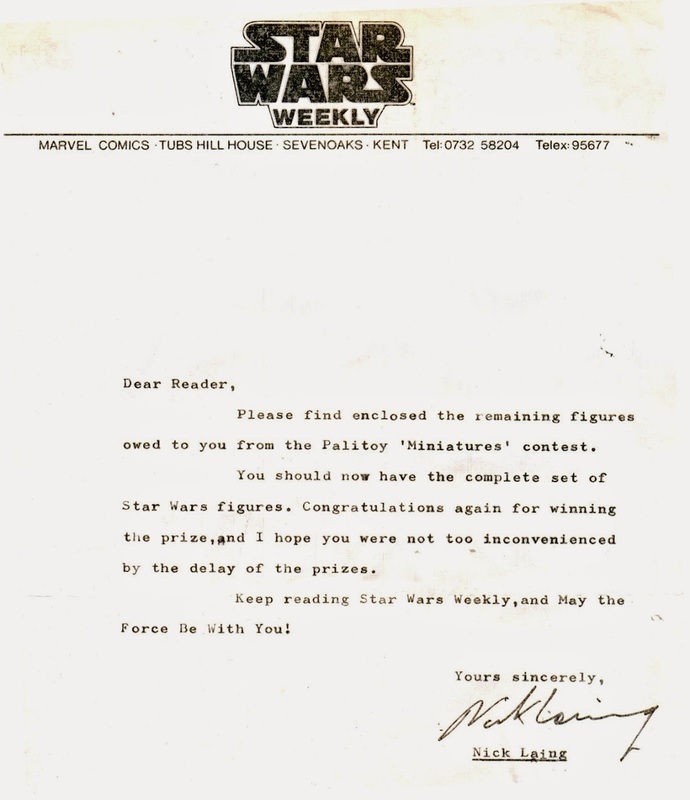 Still, upon receiving his initial haul of figures, David received a note from "Star Wars Weekly" apologizing for their being capable of sending only part of the 12-figure prize. Jawa, Sand People, and DSC were still not available. Here's that note. Fortunately, a little while later, the rest of the figures arrived along with this follow-up note. Pretty cool, right? Presumably, the vinyl cape Jawa that was rattling around among David's stuff is the one he received as part of his prize. Since it was one of the first Jawas Palitoy had on hand, it was the notorious VC version. 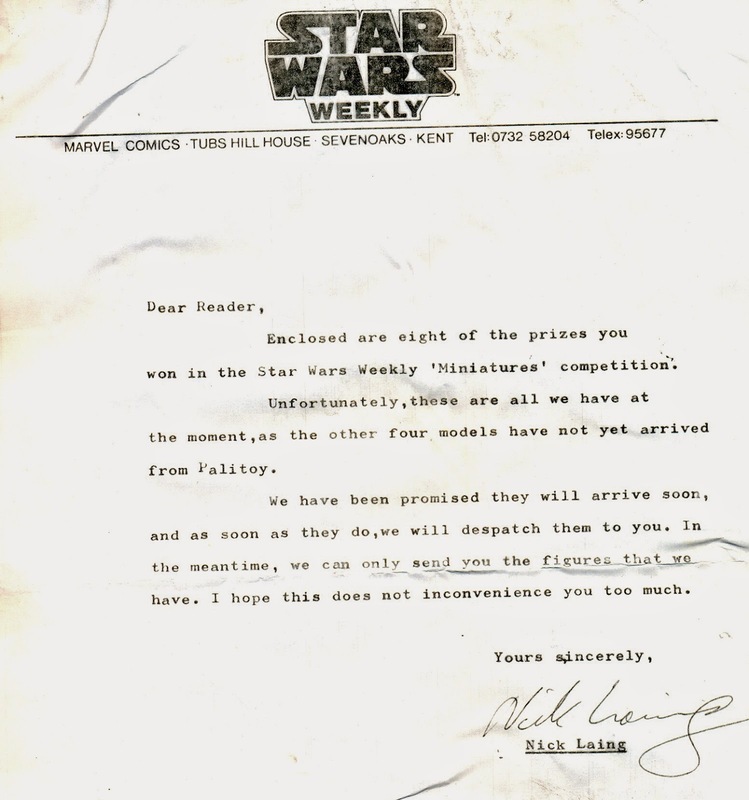 Richard and Ben later tracked down an original copy of the "Star Wars Weekly" issue in which the contest ad first appeared. Here's a scan of the page as David must have seen it back in 1978. Thanks to Richard and Ben for sharing this material. If you haven't yet checked out their excellent podcast devoted to vintage Star Wars collectibles, I heartily encourage you to give it a try. The pair are regular posters at the Star Wars Forum UK. Thanks for the great write-up Ron. I still get a warm nostalgic feeling every time I am reminded of this purchase.